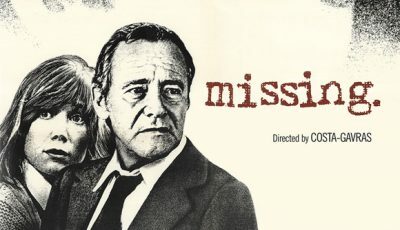 Costa-Gavras’ controversial 1982 political thriller, Missing, charts attempts to discover the whereabouts of missing journalist Charlie Horman by his father and wife amidst a bloody military coup in Chile. Costa-Gavras’ 1982 political thriller, Missing, begins by painting a bleak picture of its stage: Chile during the 1973 military coup. 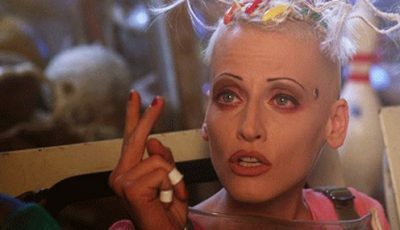 Sporadic gunfire off-screen splinters Vangelis’ operatic piano, dead bodies strewn in the street and covered in blood offer disconcerting backdrop, and the omnipresent army personnel hound and harass spreading fear not hope. It’s where American journalist Charlie Horman (John Shea) lives and works, and is where he will become the “missing” person alluded to in the film’s title. 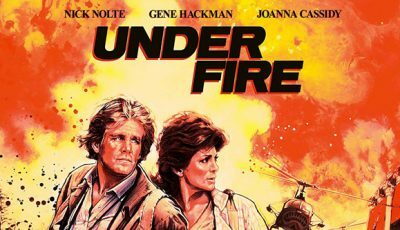 A provocative film at the time of its release, it remains a potent document of American foreign policy while providing an intimate portrayal of US citizens caught in the crossfire. 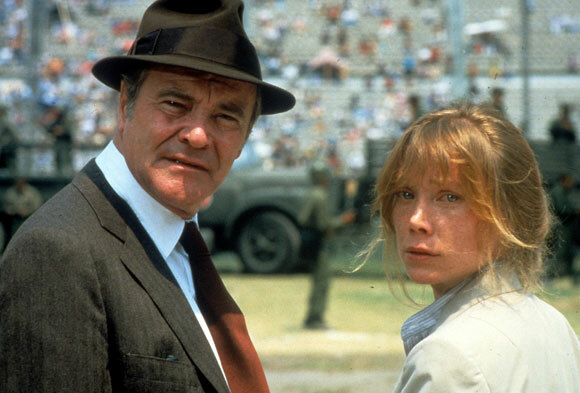 Missing offers little respite from its unsettling beginnings, fear and paranoia complementing a first act that thrusts us into the coup as outsiders (much like Horman), then underlining the film’s longer second and third acts as wife Beth (Sissy Spacek) and father Edmund (Jack Lemmon) desperately search for their husband and son. Controversial for its anti-US government sentiment, Costa-Gavras skilfully re-engineers the detective story by supplanting the sleuth with a parent on a mission to discover the truth about his son’s disappearance. A hard-nosed businessman with conservative leaning politics and an admiration for his country’s democratic values, Edmund possesses a belligerence that unsettles US officials on the ground who are busily covering their tracks. He therefore begins to make inroads into bureaucratic red tape, his investigation uncovering startling details about the bloody coup. It’s a character trait that gets things done but probably forged a wedge in the relationship between him and the missing journalist – their politics didn’t see eye to eye. 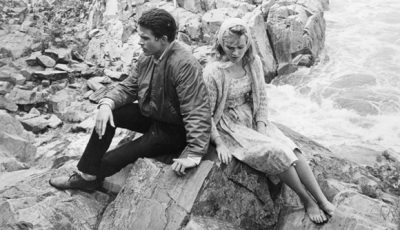 Charlie had been working for a leftist magazine in Chile, his anti-establishment life choices displeasing a father averse to radical, bohemian thinking. It is the combination of Edmund’s pursuit of truth and the muddying of his own value system, that makes the man so compelling. Lemmon captures it brilliantly. The Hollywood icon finds our empathy in this man’s plight despite initially dismissing his son as reckless and stupid; and equally belittling his wife’s concerns and allegations, even suggesting Charlie was having an affair. Lemmon doesn’t default to that easy-going charisma he so casually produces to great effect in many of his movies, instead, he’s stone-faced, matter of fact, and somewhat unlikable. But his subtle transformation from inconvenienced to victim is heartbreaking; it isn’t just tragedy that befalls him but the realisation that the democratic values he once defended so stoutly are now creaking under rotting foundations. 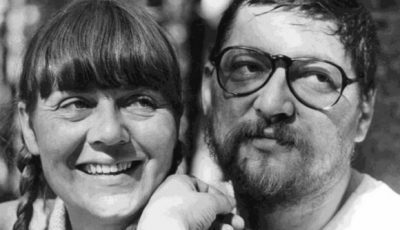 It is Lemmon who gets the plum role over the dependable Spacek whose contempt for the United States’ presence in Chile eventually overcomes Edmund’s national pride. Their uneasy relationship offers a fractious subplot to proceedings as the pair try to piece together information from sources spanning the spectrum of truth-tellers to downright liars. What Costa-Gavras’ film lacks in detail (at times he asks too much of us to fill in the contextual blanks, stalling momentum), it more than makes up for in its unique, two-pronged civilian detective story. 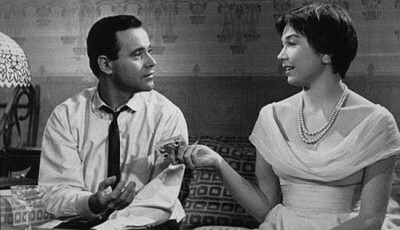 And it boasts one of Lemmon’s finest ever performances. 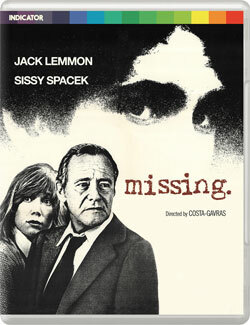 Missing was released on Blu-ray in the UK by Powerhouse Films on August 27. To find out what’s included in this limited edition release, click here.